Epcot Forever, a new nighttime spectacular at Walt Disney World Resort, will debut 1st Oct 2019, on World Showcase Lagoon at Epcot. The limited-time show will be a celebration of the past, present and future of Epcot, built around the magical soundtrack guests have come to know and love at the park. "‘Epcot Forever’ is a celebration of what Epcot has been and what Epcot is going to become," said Alan Bruun, show director for Disney Parks Live Entertainment. 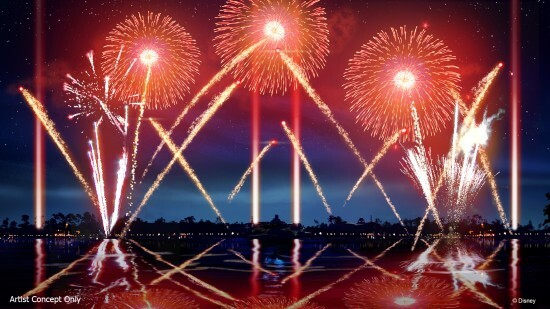 "Music is the star of the show, and we use songs going back to the very beginnings of Epcot to music in the park today – from attractions, spectaculars and other shows – and put them into a fireworks spectacular on the lagoon every night. Guests are going to hear music they know and love but in a whole new way." The current Epcot nighttime spectacular, "IllumiNations: Reflections of Earth," will end its dazzling 20-year run on 30 Sept 2019. Now, more than ever, guests will want to bid the show a fond farewell this spring and summer to once again take in a nighttime extravaganza dedicated to the joyful history of humanity and the remarkable achievements of our time. After it launches 1st Oct, "Epcot Forever" will continue into 2020, when it will then make way for the debut of the next epic Epcot nighttime spectacular as part of the park’s multi-year transformation.